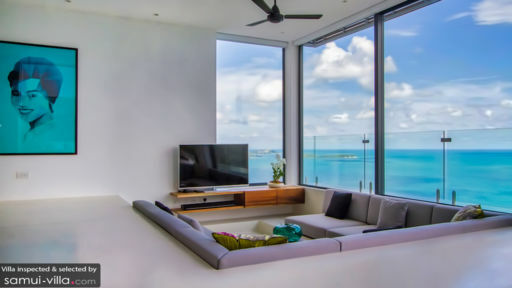 Providing 180-degree views across the spectacular panoramic vista that lies ahead, 180 Koh Samui is a contemporary and stylish holiday villa providing excellent amenities including five, well-furnished bedrooms, a luxurious infinity swimming pool, and ample open spaces that maximises on the luscious natural surroundings. Spread across three to four floors, the villa provides a sanctuary and a home away from home to groups of families and friends traveling to the island! Crisp and elegant interiors mark each nook and cranny of the villa, and the location between Lamai and Chaweng is an ideal spot to be in. With five bedrooms, there is ample space for large parties to hold a get-together to make cherished memories. There are three master suites with king-sized beds, and two with singles and full single beds. Each bedroom has been equipped with smart TVs that have internet access and Netflix so you can watch all your favourite shows in this serene ambiance. Four bedrooms lead to individual terraces furnished with daybeds and looking out to the ocean. There are en-suite bathrooms with each bedroom fitted with showers and other amenities. Marking the edge of the world in a glorious infinity swimming pool and a Jacuzzi designed to deliver a one-of-a-kind experience, 180 Samui delivers on the promise to enhance your tropical experience multifold. Gaze out towards the ocean or relax and lie back on the sunbeds found on the deck for blissful moments spent appreciating the simple things. There is nothing but oblivious waters of the ocean, the changing colours of the skies, and sprawling white sand beaches ahead of you. Verandas and balconies are graced with languid daybeds that offer a cosy, little spot for an afternoon siesta! The living area is just off the infinity swimming pool, where you will find a sunken seating area equipped with comfortable sofas, a 55” 3D Smart TV, and a SONOS wifi sound bar. The all-white interiors enhance the beauty of what lies right outside the glass windows i.e. the azure blue ocean and sun-kissed skies. A spiral staircase leads to the bedrooms upstairs and adds to the modern aesthetics that the villa is teeming with. There is a pool table for your enjoyment, and a bookshelf lined with bestsellers and intriguing artefacts! On the other side of the swimming pool, across the seating, there is the 10-seater dining table where guests can enjoy a meal together with everyone. The fully-equipped kitchen resides in the back which is both outdoor and indoor giving you the best of both worlds. Fitted with world-class amenities that can be put to good culinary use, the kitchen is where the 180 Gala Dinner is held and also the Seafood and Meat Feast BBQ prepared by professional chefs. Overseen by a villa manager, the staff includes regular housekeeping and maintenance, CCTV cameras outside in the premises for your security, and a daily breakfast served hot and fresh! Concierge service allows you to request for services like excursions and a massage in-house. Nestled amidst Lamai and Chaweng, guests of 180 Samui have the advantage of heading out to both beaches, one which is an exciting hub with beachside restaurants, bars, and cafes, and the other which is more laid-back and easygoing! Head to the golf course for a spin on the fields and grab a drink once the sun sets. Believe it or not, people this place really exists, the photos are real. If you want a truly blissful amazing holiday, this is where it's at!!!! You'd have probably read all the other reviews on how fantastic the place is, the views, how it looks better than the pictures, etc and yes, it's all TRUE so I'm not going to repeat it. What I'd like to share is our experience with Tuu (the manager) and her 2 wonderful staff. Tuu was nothing short of the perfect manager! She's genuinely warm and caring and makes the effort to remember our food preferences. One of our family members had allergies to certain types of food and she made a note of it and made special dishes for him. The little touches come when she makes it a point to have those shared dishes parked on his end of the table (it's quite a long table). When it comes to the food, it's absolutely ridiculous how good she cooks. If she opens a restaurant, I'm willing to bet my house that she'll get a Michelin Star for sure! Not only was the food super tasty but so much effort went into the presentation of it. Best of all, she's great at both Asian and Western food. All the ingredients were fresh and she sources them personally. She told us that Samui is famous for coconuts and when we asked if we could get some, she was very happy to get 10 for us. Even when serving us Mango sticky rice, each mango was carved out as a rose (10 of them) and the rice in the shape of a heart. She turns even this simple Thai dessert into a work of art. However, what blew us away was her pursuit of perfection as her first attempt at the sticky rice didn't work out so she prepared mango with coconut ice cream instead and told us that she'll do the sticky rice the next day. She then prepared 2 types of sticky rice in her own home and then brought it to the villa the following day. How's that for dedication? The food was so good, we had every meal in the villa and, I didn't step out of the villa the whole 4 days we were there (expect to go back to the airport)! The prices are what you'd expect from a higher end restaurant but Tuu's food is definitely better (and you can dine shirtless after a swim!) We would definitely go back there again but only if Tuu is there. If not, it'll be just another great villa with fantastic views! Tuu was a great host she welcomed us into the villa as if we were family. She had great communication from the time of questioning to book this location all the way to leaving the villa. She made us feel extremely comfortable everything from the welcome to the going away. With her and staff it felt like we were leaving a family member. Exceptional 5 star service all around. Tuu is readily available when needed and she provided us with a phone that we were able to contact her if we had questions or any concerns with anything. It made us feel extremely comfortable in a foreign country with language barrier. We had a contact to reach out to when needed for any questions.she provided tips and pointers all around the island and was able to setup and schedule activities for us which made the vacation even more relaxing with less stressful. Now concerning the villa this is a phenomenal place to be at with all the picturesque views you could imagine. The sunrise to sunset is beautiful from this location. We rarely wanted to leave the villa. Beauty all around views of the ocean and the city with the lights. This villa is very spacious with a great pool and great Lounge areas all around. Even has a gym to get a good workout in before hitting the beach. 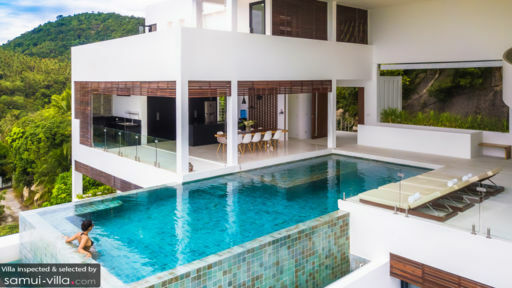 I had concerns with the villa being in an open layout exposed to outside, but it was perfect with the weather if ever returning back to Koh Samui this would definitely be the place I would stay at again and recommend for anyone. 180 SAMUI IS THE PLACE TO BE!!! Thank you for making our trip one of the most memorable experiences in our lives. What is there to say other than this was without a doubt the most amazing vacation we have been on. I surprised my wife for her 30th birthday and from the get-go, Tuu helped me with all the preparations. She always answered any question I had with a moments notice, sometime in the middle of the night. Let's start with the villa: The pictures do not do it justice. This was pure heaven on earth. Bravo to the architect. 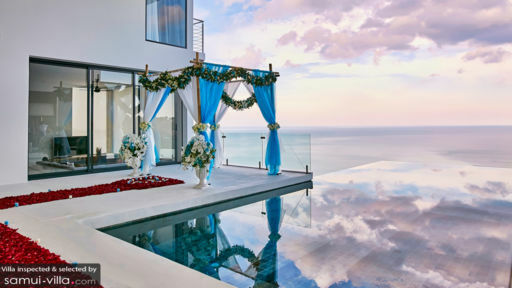 The villa is stunning with views to die for. All the rooms were spacious and clean and the standard better than in top notch hotels. Since the villa is newly built, you also got a deluxe feeling. The amenities were great. If one is picky, I would like to see a treadmill for the gym. The pool was very clean and had a good temperature. The host was AMAZING. So kind, looked after all of our needs and a WORLD-CLASS chef. My god, why hasn't she started her own restaurant? None of the dinners we ate outside could hold a candle to her. Seriously, I have eaten at three-star Michelin restaurants and this was right up there. Try especially her Thai cuisine. All in all, this trip was worth every penny. The staff at the villa were very kind and felt like a part of our family at the end of our trip. The service impeccable and we found ourselves exploring the island far less than what we thought since we didn't want to leave 180 Samui! Thank you, thank you, thank you is all I can say. We will cherish this trip forever. We have travelled the world and stayed at some of the best hotels in the world and this trip was absolutely MAGNIFICENT.